There are six black on white house designs in this chart pack. 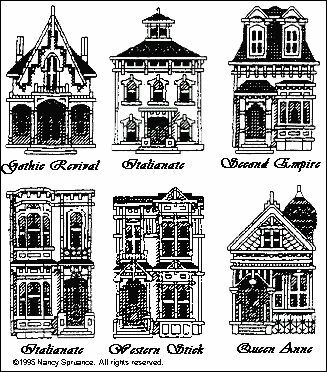 Each house is a detailed representation of a Victorian architectural style that finishes to 2"x4" when stitched on 14 count fabric, and they fit perfectly in a precut 5"x7" mat. A Victorian street scene is easy to create by connecting individual houses with one or more of the 12 different fence designs included as add-ons with this chart pack. One or more of the seven lamppost designs can be added for additional interest, and a dash of color can be added by filling an urn (there are three different ones included) with French knot flowers. The add-ons even include birds in flight and an alphabet. But best of all, these designs are quick to stitch and loads of fun to do.